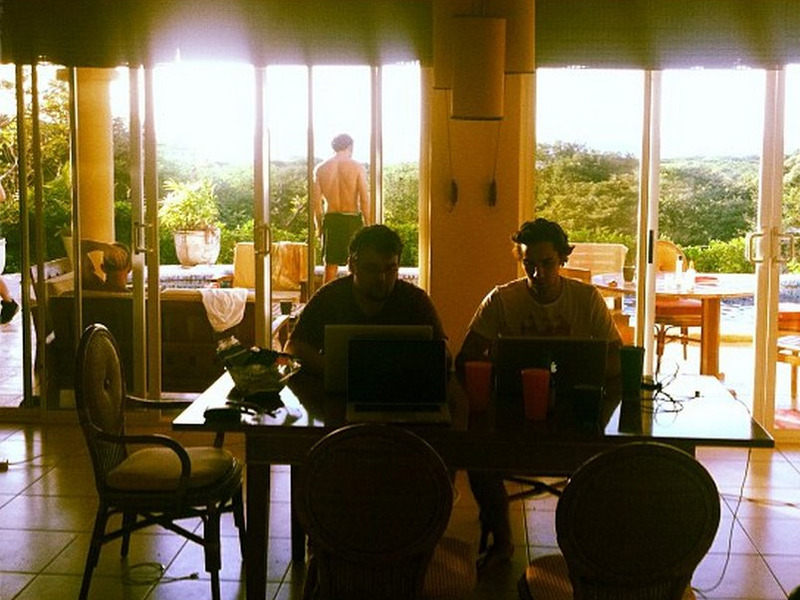 Instagram/TravisKalUber rented a beach house in Costa Rica to deal with its biggest night of the year in 2011, New Year’s Eve. The biggest day of the year for ride-sharing startup Uber is always New Year’s Eve. 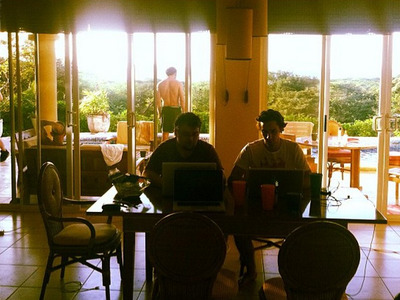 On New Year’s Eve, December 31, 2013, the company generated $US10.7 million in gross revenue, a staggering 369% increase from New Year’s Eve in 2012. Uber keeps roughly 20%, so that’s $US2.14 million in net revenue. How did Uber generate almost $US11 million in a single day? Uber was in 42 more markets in 2013 than it was at the end of 2012. But its mature markets (NYC, San Francisco, Los Angeles, Chicago, Washington, D.C.) generate the bulk of the revenue. Los Angeles generated almost as much as the 49 smallest markets combined. In San Francisco, Uber encouraged drivers who don’t typically log-on on weekends to work NYE 2013 by telling them they could be eligible for a $US50/hour earnings floor. 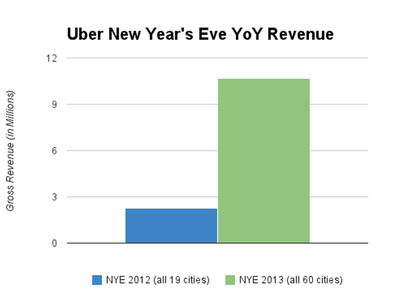 In Chicago, Uber completed 22,558 rides last NYE. There were 1,986 active drivers that night; 30 of them earned more than $US1,000. About 62% of UberX rides that night had surge pricing (Uber Black was closer to 40%). 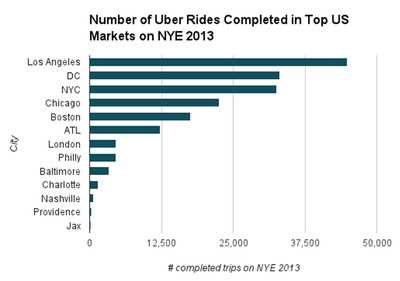 In New York, Uber completed 32,547 rides on NYE 2013, up from 4,785 the year prior. Gross revenue increased by almost $US1 million. In London, one of Uber’s largest international markets, there were 4,580 trips on NYE 2013 with just over 500 drivers on the road. 52% of those rides had surge pricing. NYE bookings grew more than 15X from 2012 to 2013 in London. Los Angeles was the most active city on Uber last New Years Eve. There were 44,855 trips with 3,000 cars on the road. 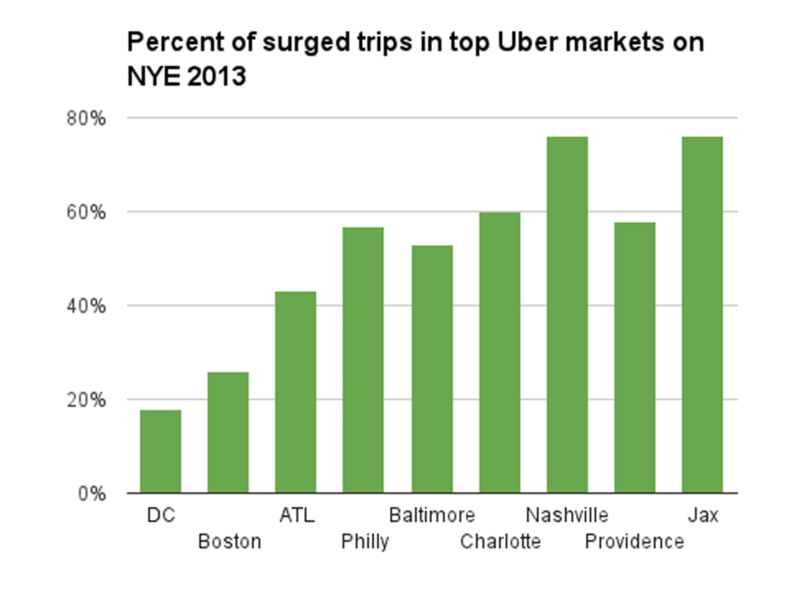 And here’s how many of those trips had surge pricing attached to them on NYE 2013. Now let’s look at city-by-city revenue breakdown on Uber’s $US10.7 million day. 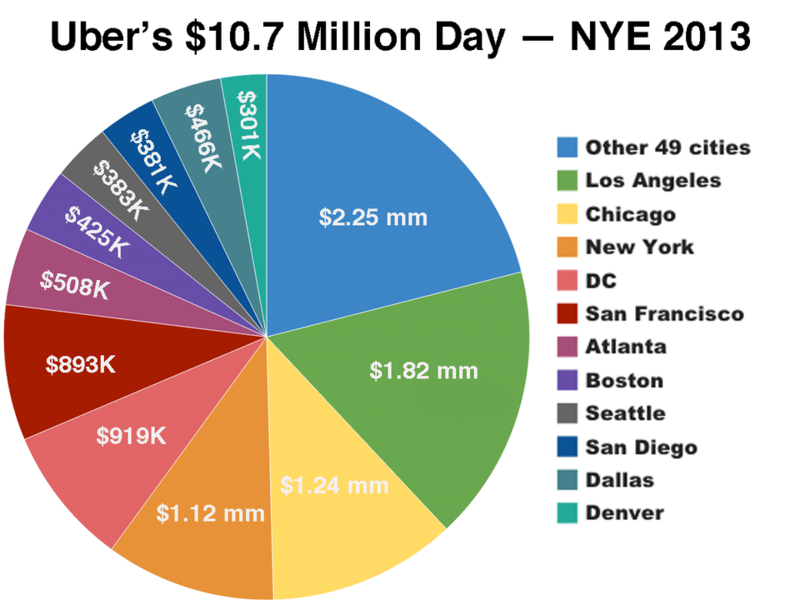 Three cities generated more than $US1 million in gross revenue for Uber that day: Los Angeles, Chicago and New York. DC missed $US1 million by a hair ($US918,918). 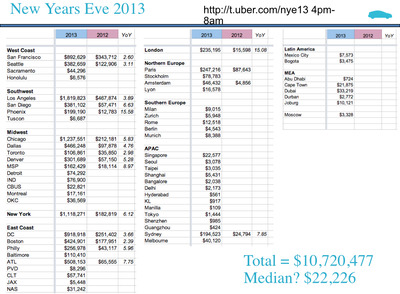 Total gross revenue on New Years Eve grew 367% from 2012 ($US2.28 million) to 2013 ($US10.7 million). 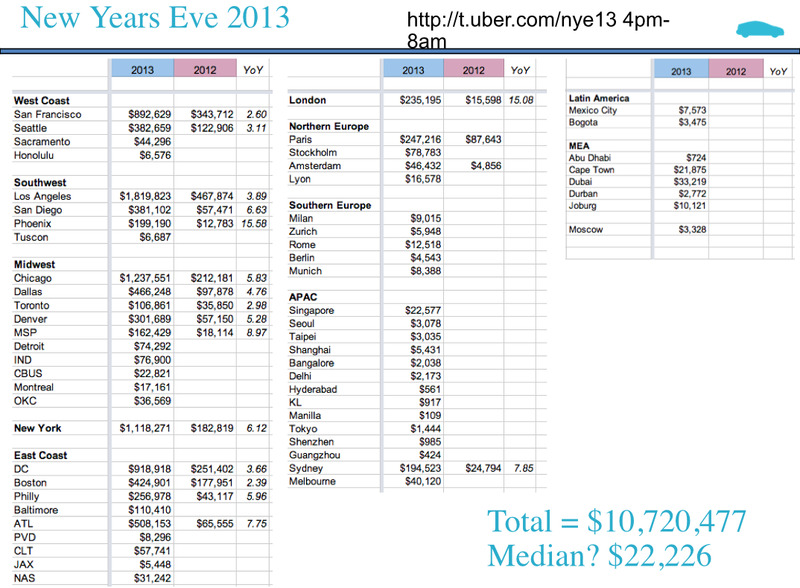 And if you really want to geek out on the data, here’s city-by-city New Year’s Eve revenue from 2012 and 2013. Note, the million-dollar cities are extreme outliers. The median was only $US22,000.